With our car park cleaning in Swansea service’s, you can rest assured your commercial area will be left spotless and presentable. Take a look at our testimonials page to see the standard of service, and the stunning level of cleanliness you can expect to receive when getting commercial pressure washing in Swansea from us. The skills of our industrial pressure washers in Swansea guarantee we will have your business premises looking their best in the most efficient time possible. We will use powerful jet washing apparatus to give your commercial property a deep clean, using highly effective detergents to remove stubborn stains, dirt, and dust. Our car park cleaning in Swansea service will save you time and money, whilst delivering spotless business premises. No matter how big or small the area that needs cleaning is, we have the right skills and tools to get the job done right. Our professional Swansea shop cleaners will use a highly effective jet-washing method to fully remove chewing gum, stains, and dirt. And, to fit us into your busy schedule, we make sure you will be able to choose from a range of booking slots, including weekdays, weekend and in the evenings, for the same price. Our team can clean a number of commercial areas, including car parks, public walkways, sports courts, industrial and commercial premises, fast food restaurants and grocery stores, hotels, nurseries, and amusement parks and rubbish collection and holding areas. Vehicles, Caravans and Boats you needn’t worry about your own or your customer’s health, as we use eco-friendly cleaning products, as part of our ongoing policy to deliver environmentally safe services. And, when booking more than one service with our car park cleaning in Swansea specialists, we will offer you lower prices. 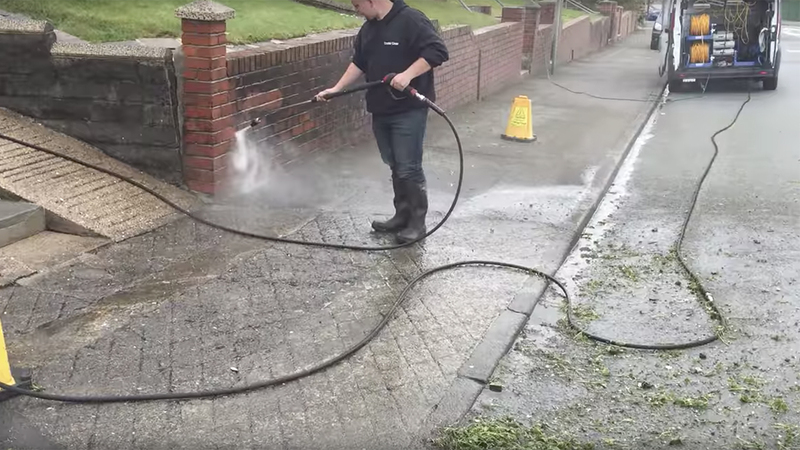 For example, combine commercial pressure washing in Swansea with window cleaning or fence cleaning, and you’ll be in line for a great discount. To make your building look as good as new turn to our team of professionals. Our pressure washing service Swansea has become very popular all over the city. We have many years of experience in delivering top result’s, and a constantly growing list of satisfied clients. It’s our affordable rates and high-quality services appeal to our clients and keep them returning! You can see for yourself what they’ve said about us, over on our testimonials page to get some idea of the immensely high standards you’ll be in line for when you start using our expert cleaning options. Our team members have been extensively trained and are very knowledgeable in washing outdoor spaces. We use the most sophisticated cleaning equipment and very effective detergents to remove all stains and signs of pollution. We have a Wide Range of Services Throughout Swansea. Our team members have successfully removed stains, moss, mould, pollution signs and more from brick, stone, concrete and other building surfaces. You can rest assured your property’s exterior will look amazing after we do our job. For your convenience, you can book our pressure washing service Swansea every day of the week and in the evenings for the same price. With us, you can choose from a large variety of affordable, expert services. Pressure cleaning makes such a difference to the look of the area, if you need an area to look like new again we can clean and restore a wide range of surfaces using a powerful rotary headed pressure that is effective enough to remove unsightly marks, dirt/grease, graffiti, most oil stains, weeds, moss and algae from all types of surfaces. We offer a range of cost effective high pressure cleaning services for Industrial and Commercial premises. Call 07846 873344 now. Our experienced customer care staff are available around the clock to offer you free, no-obligation quotes and help you identify and book the right pressure washing service for your needs. You can receive immediate answers to your questions through our online chat support feature as well. You can also choose to fill in our online booking form to schedule jet wash services right away. Have your domestic or commercial building looking like new, at one of the lowest prices in and around Swansea.